Lello 2720 Pastamaster 2200 Pasta Machine is the best pasta maker for you if you are looking for a machine that can mix and knead pasta easily. And because it is automatic, this machine can make up to 2 pounds of fresh pasta in less than 20 minutes. Aside from that, this wonder product is a full cycle, electric powered pasta machine, which means that it is capable of handling all the steps of pasta making — from mixing to kneading and of course molding – quite effortlessly. The complete Lello 2720 Pastamaster set comprises of six discs to make six different pasta types — from lasagna to spaghetti and from macaroni to penne. It has a powerful 1300-watt motor which means that it’s heavy-duty, a perfect tool for those who make a lot of fresh home-produced pasta regularly. It’s a bit pricey at nearly $150, but with it wide array of features, you can count on getting what you paid for. By the looks of it, the reviews for this product are bordering on the excellent. If you are a newcomer you will be able to make six commonly cooked pastas with the starter set. However, serious homemade pasta chefs can simply buy some extra discs to make other types of uncommon pastas. A customer who had been using this product for a couple of months testified how she loved the Lello 2720 Pastamaster 2200 Pasta Machine. She said that she had been making fresh pasta in the past, and of course had a wide experience with using a variety of pasta machines. 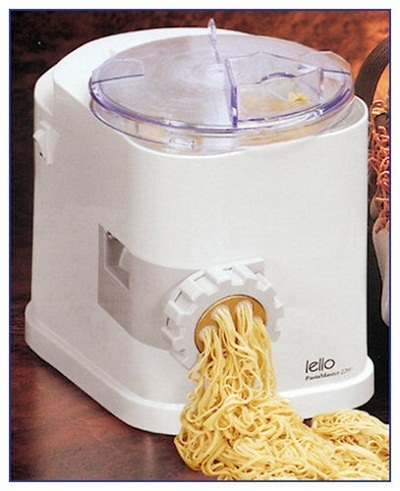 But with her discovery of Lello, she could now make pounds of pasta quite easily. Another client who is on a spelt flour diet was thankful to have bought the Lello machine. With it, she could make pasta of spelt flour and enjoy her favorite food without having to break her diet. One person added that preparation time was minimal, which is usually broken down into 5 minutes of kneading and 20 minutes dispensing, all done by this single pasta machine. For beginners, it is advised that they follow the recipe carefully but for experts, they find it easy to experiment using different types of flours and still yield quality results. A satisfied customer also said that the pasta produced by this Lello model cooked easily and was undoubtedly rich in flavor. Among the negatives of this product were unclear illustrations on its user’s manual and its lack of online customer service such as website. There was also a lot of complain about the noise which was somewhat similar to that of a bread machine. However, these minor flaws can be disregarded as the majority of Lello users approved the quality of pasta produced by the Lello 2720 Pastamaster 2200 Pasta Machine. In shape, they were firm; in taste, absolutely delicious. Moreover, despite its unclear illustrations, the textual instructions were clear. Keeping it tidy was not a difficult task at all, since the machine’s design was simple, compact and it only had the essential parts. An overwhelming number of people have highly recommended this product. So if you are going to invest in a quality automatic pasta maker, you may as well buy Lello 2720 Pastamaster 2200 Pasta Maker which has won the good will and approval of so many people.